I'm all about quick and easy meals because of our crazy work and activity schedule. This is no exception because it's really two steps - cooking the chicken in the Instant Pot and making the cilantro lime pesto. You can do both in advance and combine just before dinner. You can also combine both the chicken and pesto in advance to allow the chicken to absorb all the flavors. I've also included the make ahead/freezer instructions below too. Back to the recipe, the pesto is really the star of this dish. While the chicken is cooking in your Instant Pot, you can prepare the pesto by combining everything in a blender or food processor. Before you know it, it's just a matter of tossing the two together. Aside from tacos, we enjoy this in burritos, tostadas and even on tortilla chips for heartier nachos! Season your chicken breasts on both sides with salt, pepper and garlic powder. Plug in the IP and add your seasoned chicken and chicken broth to the IP pot. When the IP beeps after pressure cooking for 7 minutes, allow your IP to naturally release pressure for 10 minutes. While naturally releasing pressure (also known as NRP or NR), the display will reflect numbers counting up from 1. The numbers indicate how many minutes the IP has stopped cooking since it beeped (or how many minutes it has been naturally releasing pressure). No need to touch your IP while it naturally releases pressure. Remove chicken breasts from IP and transfer onto a cutting board. Chop or shred chicken breasts and place in a large bowl. 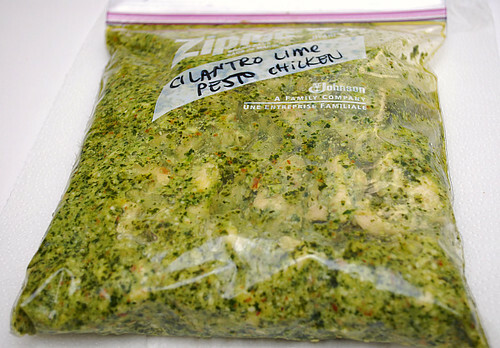 Add 1/2 cup of cilantro lime pesto (recipe below) to chicken and toss to coat. 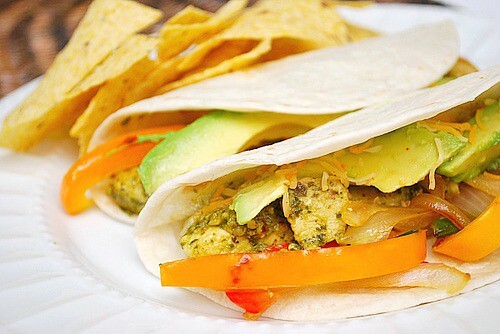 Use chicken for filling tacos, burritos and/or tostadas or top nachos! Top with your preferred garnishes. Using a blender or food processor, mix together the cilantro, olive oil, almonds, garlic, lime juice, asiago, salt and chicken broth on low speed for 2 minutes.